Want to learn how to start meal planning for your family? Inside you'll find easy meal planning tips and tricks plus all the resources you need to plan meals your family will love. 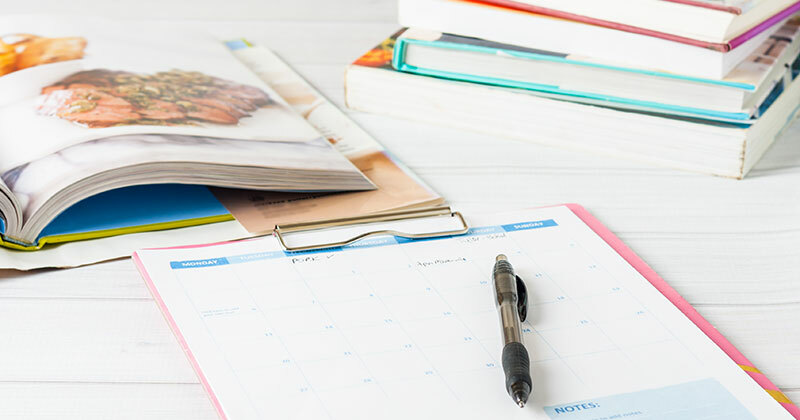 If there was one thing that I could tell busy moms to do to help them feel more organized and less stressed it would be this: start meal planning. Before I had kids, I didn't give a lot of thought to what we would have for dinner. I'd stop at the store on the way home and pick something up to cook, or order in. But with kids to feed, busy schedules, and a tighter budget, I soon learned that meal planning is a lifesaver when it comes to dinner time. When you first start meal planning it might seem overwhelming. There are so many meal ideas to choose from so how to do you even begin to decide? It might even seem like you're spending so much time planning meals that it's not actually saving you time in the long run. It doesn't need to be this way. Once you get the hang of it, meal planning can save you enormous amounts of time, money, and stress. When you follow these easy meal planning tips and tricks you'll be on your way to making healthy meals your family will love, saving money at the grocery store, and feeling less stressed over "what's for dinner?" every night. Ready for my favorite easy meal planning tips and tricks? Here you go! You do not need to make a completely new menu every week. Most families cycle between about 8-10 meals regularly. Make a list of the meals that you know your family loves and will eat. This can be anything from staples like spaghetti and meatballs to simple favorites like roast chicken and mashed potatoes. As you make new dishes that your family enjoys, add it to your list. When you are searching for recipes, it is a lot easier if you have them sorted by the type of protein or a type of dish such as pasta, meatless, etc. When organizing your meals to choose from, keep them sorted this way. When you are putting together your meal plan, aim for one new meal every week. Keep a Pinterest board or a recipe binder full of recipes you want to try. This way you can change things up, but also make sure your family will eat what you make. There will always be a reason why we didn’t get to a meal, or we end up making too much. To ensure that your food doesn’t go to waste, make this night a leftover night. We have "Sunday Smorgasbord" where we get out all the leftovers and let everyone pick their favorites, and it is actually my boys' favorite dinner of the week. You will want to eat out at some point in the week. Rather than denying your family from ever having pizza delivered again, plan for a meal out at least once a week. For us, Saturday is takeout night, and it's a treat for everyone (especially me since I don't have to cook!). Set up a regular schedule of theme dinners to help you narrow down your choices. Meatless Monday, Taco Tuesday, Wok Wednesday, and Pizza Friday are some of our favorites. Here are some more fun dinner theme night ideas to check out. Consider your time challenges when you are planning which meals to make each day. On nights when you have after school activities, a crock pot meal that you can prep in the morning is a better choice than something that requires more hands on work when you get home. Unless you have completely cleared out your pantry, fridge, and freezer, start here when making your meal plan. Keep a running inventory of what you have on hand, and see what meals you can make from this list first. I often just google groups of ingredients and have discovered some new family favorites this way. Use your favorite store's weekly sales to help you decide what to make each week. If there's a great sale on chicken, plan to make some of your favorites that week. PS - did you know The Dinner Daily will do this for you? It's ah-mazing. They will make your custom meal plan each week based on your store's sales. Check it out here. Don’t try to make your list while you're sitting in the car line. You'll never remember off the top of your head what you have at home. Instead, make your list at home while looking through your pantry and refrigerator so you know exactly what you have already. Make your shopping list by categorizing each item by aisle. If you don’t know the aisle, group like items together. This will help you get in and out of the grocery store easy, and avoid the temptation to impulse buy. Even better, take advantage of online shopping and grocery delivery through Peapod and you won't even have to set foot in the store! Get started here. What's the best meal planning trick for busy moms? Let someone else do the work for you! 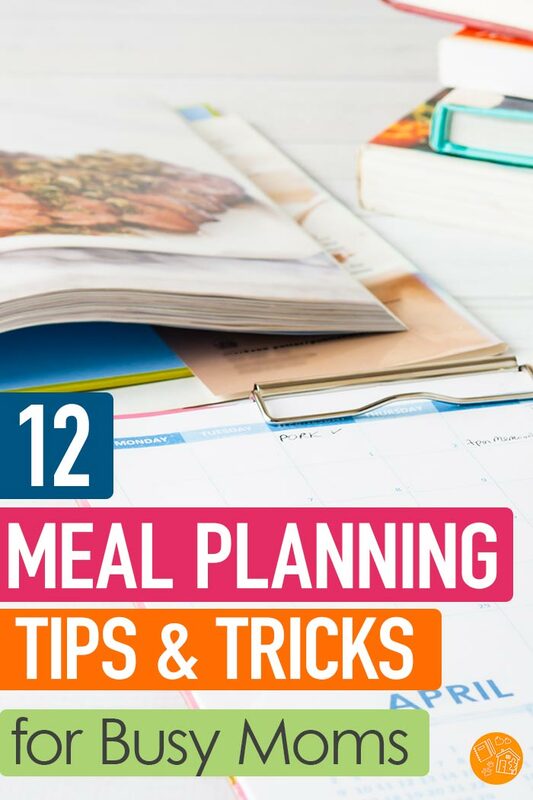 When you have access to ready made meal plans, tons of family friendly recipes, lists and planning tools, you can rock your meal plans like a boss and have plenty of time for the things you actually want to do. This is the ultimate tool for making meal planning simple. My friends at Ultimate Bundles have made put together tons of ready-made meal plans with a focus on quick & simple, but delicious, healthy meals – complete with shopping lists and fresh recipes – for a ridiculously low price. Meal planning printables for those who love paper & pen and creating their own custom plans including my own Family Meal Planner. Plus healthy eating resources on clean eating, a flavor crash course, strategies for helping kids with pickiness, allergies or oral SPD, and more! 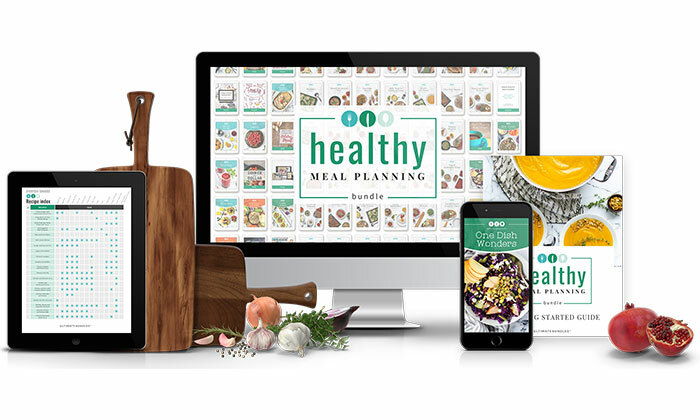 With the Healthy Meal Planning Bundle, you’ll have hundreds of recipes available in one place, so you can find what you need quickly, thanks to the bundle's clickable, convenient index. You’ll find all the recipes in one place, plus you can ignore recipes that don’t fit your family’s diet or preferences, or even find recipes that will help you use up that last bit of produce. You also get nutritional info for every recipe, so you’ll know the macros, fiber, and fat grams for everything from that matcha tea latte to the crockpot beef stew you’ve been craving to that decadent chocolate lava cake. They’ve even standardized every single recipe, and put them all into 12 categorized, beautifully formatted and easy to use digital cookbooks, AND made more than 30 unique and practical meal plans to go with them (grocery lists and prep plans included). For just $49.97, you can get 1072 recipes, 30+ meal plans, meal planners and printables, plus eBooks and eCourses on topics like meals on a budget, learning how to cook, and teaching kids to help in the kitchen. It’s a no-brainer deal. The Healthy Meal Planning Bundle includes my own Family Meal Planner as just one of the amazing resources to help you get started with meal planning. 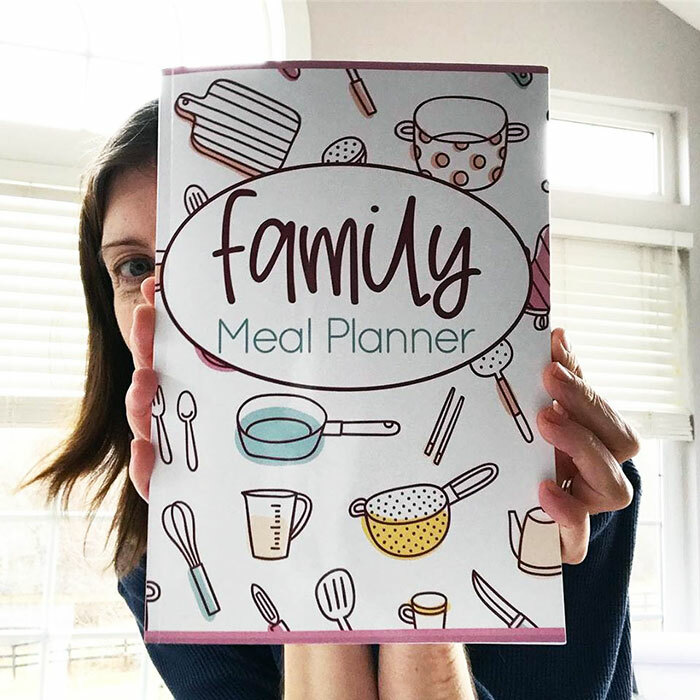 If the bundle isn't in your budget right now, you can purchase the Family Meal Planner on it's own for only $4.99. Pantry, Refrigerator, and Freezer Inventory: know what's there so you can make meals with the ingredients you have. Family Favorite Dinner, Lunch, and Breakfast logs to keep track of what's tried and true. A year's worth of monthly and weekly meal planning pages for you to customize with your favorites! Plus the pages can be resized to fit any size planner, including my favorite Happy Planner sizes. Or if you prefer a printed version, you can find it on Amazon here. Love these ideas. We love a theme night...taco Tuesdays or breakfast for dinner are two of our favorites. As a working mom who has a hard time getting "good" meals on the table, I am so in love with this post. Thank you for these fabulous pointers, Laura!